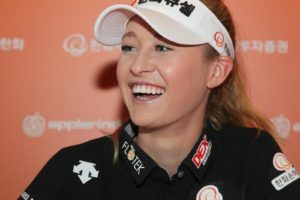 Nelly Korda, one of our sponsored athletes, has overtaken a field of very talented competitors to become the top-ranked American LPGA golfer in the Rolex World Rankings. “The 20-year-old’s play of late has solidified her as the top American female golfer, as she officially passed Lexi Thompson on Monday in the Rolex World Rankings. Korda is No. 6 in the latest ranking, and Thompson is No. 9. Korda’s older sister, Jessica, is the next-highest ranked American at No. 12. Nelly moved up two spots after finishing T-2 at the Bank of Hope Founders Cup, one shot behind winner Jin Young Ko. Thompson did not play the event. Nelly’s rise has been steady after having made her first big appearance in the U.S. Women’s Open in 2013 as an 14-year-old. She made the cut as an amateur and finished T-64. After turning pro at age 18 in 2016, she played a full season on the Symetra Tour, winning once and qualifying for the LPGA Tour for the 2017 season. She had five top-10 finishes in her rookie campaign, and then a year later claimed her first LPGA Tour win at the Swinging Skirts LPGA Taiwan Championship last October. Congratulations Nelly on your incredible accomplishment, including your victories in the Taiwan Championship and the Australian Women’s Open. DEX Imaging is proud to support you.